Are You Asking These Questions to Build Effective E-Learning? How we view effective elearning is somewhat subjective. For some it requires that all elearning center on performance. If it’s not, then how can it be effective? However, many elearning courses are less “learning” and more marketing. They’re about sharing information using elearning tools. I see those more as multimedia marketing campaigns than traditional training programs. For example, the human resources department is introducing a new bonus program and they want to have an “elearning course.” While they may call it elearning, it’s really more about creating awareness and not setting performance goals. At least not immediately. Ultimately the efficacy of elearning centers on the original course objectives and whether or not the course meets them. Performance-based courses need to prove that the learner can meet the performance goals. Information-based courses need to demonstrate a greater awareness of the content. Both types of courses have their place in the elearning landscape. Following are some keys to effective elearning. Is the course building greater awareness? I worked on a project once where it was taking too long for new hires to get up-to-speed in a production environment. The training program successfully taught the new hires everything they needed to DO. But after doing some analysis, we recognized that it wasn’t that they didn’t know how to do the work, it was that they weren’t completely aware of how their work fit in the grand scheme of things. So we added a few modules that taught them more about the overall production process and how they supported the organization. There were no performance goals in these modules other than to share additional information. Once they were made aware of this, the teams started meeting their production goals. Our initial mistake was that we only focused on the performance goals. They were able to perform their tasks. But because they were new, they lacked awareness of the bigger picture. While we want to focus on performance, there’s always a place for building context and framing the learning activities around that. Is the course causing the learners to think? Elearning should promote thinking. Find ways to challenge their assumptions or their existing understanding of the content. This can be wrapped in activities that mimic the learner’s world or information that causes reflection. In either case, step away from an information dump and let the learner process the information. Create activities or scenarios that offer contrast to the way they may normally see the content. Provide fresh perspective. I had a project once where the client wouldn’t budge from doing an information dump…and it was a lot of information. Our solution was to build a learning journal to go with the information. Then we presented a few case studies for the person to reflect on and document in the journal. This allowed them to wade through the information and identify the content relevant to them and their reflections. With today’s social media, it’s easy enough to transition the learning journal concept to a wiki or other collaborative forum. Is the course giving them opportunities to practice? Ultimately elearning courses exist to change understanding that impacts behavior. Knowing the right information is proven in relevant activities. We don’t just share information. We share information that allows someone to assess a situation and make appropriate decisions that produce real consequences. Are you building activities in your courses that allow the learners to practice making the types of decisions they need to make in the real world? Or the types of decisions that let them build competencies that they may need? Is the course allowing the learners to demonstrate their understanding? Decision-making activities let the learners practice and build on existing knowledge. They find ways to integrate what they’re learning in the course with what they already know. Somewhere in the process you get to the point where you need to assess their understanding. Are they able to meet the course’s objectives? Typically we use simple multiple choice or true false type questions; probably because it’s what we’re used to and because they’re easy to create. However that type of assessment only demonstrates whether a person knows the facts or not. Measuring understanding is more about how they apply those facts to make decisions. As you determine your course objectives, also determine how to assess them. Then build your course around that. We used to ask “What will it look like when I see it?” This helped us focus on tangible results. 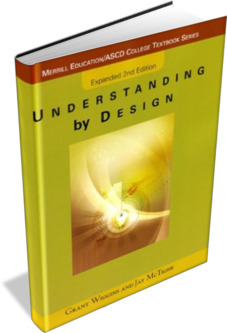 If this is new to you, I like the book Understanding by Design (an Amazon referral link). The author does a good job of helping walk through the process of building objectives framed around understanding. It’s worth adding to your bookshelf. Obviously there’s a lot more to building effective elearning than these four questions. But asking these questions is a good start and hopefully they help transition your course development away from information dumps to meaningful and effective learning. What questions would you ask? Feel free to leave a comment by clicking on the comments link. This a terrific reminder that learning design, whether it be e-learning or instructor led, is not a linear process. It is always about how to get the learner from point A to point B by taking them on a journey with lots of stops and turns along the way. I have found that success in most things is asking the right questions. Thanks for the post time. Though I’m delightfully slammed with work, I almost always take the time to read your posts. Thank you for the book rec. I’ve enjoyed your others. Re: Is the course building greater awareness? This seems to go with the Attitude part of KSA. Sometimes people don’t realize how important their individual efforts affect the larger process. Awareness is everything. From a general “Performance” perspective, one of the most effective learning activities I’ve ever participated in were “technical exchanges” when I was a Peace Corps volunteer. From early on in your service, the Peace Corps encourages volunteers to go visit more experienced volunteers and essentially shadow them for a few days. At the end of each technical exchange, we wrote reflections on what projects, techniques or ideas we had observed that we could apply in our own workplans. This was simple, inexpensive, low-tech and really effective. As volunteers, we took the next step to translate the “reflections” into a wiki – this was very valuable reference material! @Daniel: I’ll be coming to Denver sometime in 2012…still working on details. @Kelly: we used to do something similar coupled with our elearning courses. The courses delivered core content, then the learners hooked up with a peer coach who they shadowed. In addition, the peer coach would grill them on things they learned in the courses and then reinforce key learning points. Thank you for your article. As an Instructional Designer, I’m curious about the project where learners really needed awareness on the big picture. How did you find that out? 🙂 If you can share it would be great. So often we get to talk to just a few stakeholders who may not realise what learners need on the floor. Your thoughts? @Athena: good question. I like to connect with the learners. In this case, we found that they isolated new people to very specific tasks. So they only learned the basic things first. Since they needed to know all of the tasks in that dept I determined that we needed them to understand the entire process and then from there learn to do the individual tasks. That helped them understand the workflow better and that their tasks were tied to other upstream and downstream elements. Thus, doing the job faster was good for them, but ultimately created bottlenecks downstream. This is a good heads up for people to better distinguish effective e-learning courses from not effective ones. Hi, Thank you for your article. I am agree. In my case I try to learn differents languages and I found one website which has all these things and I can to build one effective E-Learning of languages. I like your post as it delineates the essentials of learning. I also believe that e-learning must be able to totally engage the learners to produce results. There should be a mix of cognitive understanding and experiential practice in order to retain well. This has also been largely supported by theories in education psychology like those of Bruner, Slobin and Strenberg. Yes, the delinearation of the subsequent preceeding posts are particular engaging for the cognitive aspects of experiential practice. I would like to put forth such acknowledgement for future reference. Any takers? Excellent post, I certainly agree that when it comes to e-learning courses awareness and asking the right questions thereby engaging the learners to think will certainly lead to insight and learning.